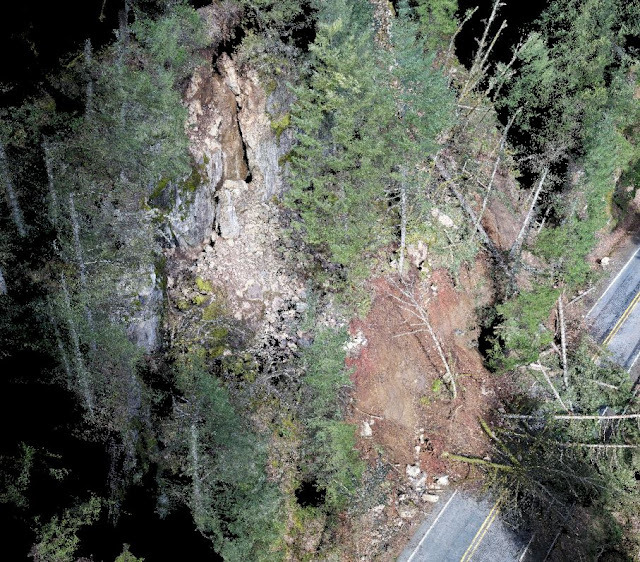 State Route 503, also known as Lewis River Road, closed on Monday, March 13, when a debris slide knocked trees and rocks down onto the highway near Speelyai Bay Road, about 21 miles east of Woodland in Cowlitz County. 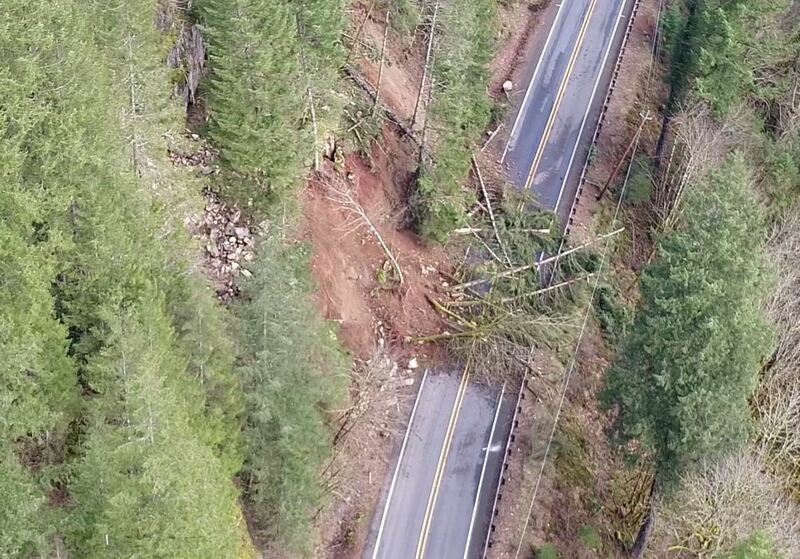 While the debris on the roadway does not look like much, the real danger is from up above. An estimated 20 million-pound rock slab has come loose from the hillside, making it unsafe for anyone below. A rock slab estimated to weigh 20 million pounds has come loose about SR 503 in Ariel. Typically, we would physically inspect the slope when it stops moving, but this one is unique and continues to move. It’s too dangerous to assess the slope from below, so we turned to some other methods. By using aerial drone technology, LiDAR (Light Detection and Ranging) and 3D imaging over the past two weeks, we’ve collected data that indicates we can access the hillside from on top. LiDAR is a surveying method using light pulses, which provides 3D images of the earth. Photos do not do it justice! We usually see debris slides containing rocks, mud and trees, but the rock slab that has dislodged from the hillside is about the size of a basketball court, approximately 100 feet wide, 60 feet high and we are not sure yet how far back it goes into the hillside. Current estimates are about 10-20 feet. We are putting an emergency contract in place with Pacific Blasting to remove the slab and stabilize the hillside as soon as safely possible. Meanwhile our geotechnical engineers will bring a drilling machine to collect core samples, by drilling approximately 200 feet down into the hillside from the top. Core sample data will tell us how dense the rock is and where the fracture points are in the hillside. That information helps us develop a removal plan, which will likely include trim blasting, rock scaling slopes, installing rock bolts and anchors as well as tree and debris removal. All of this work takes time and depends on what we find as well as ongoing weather conditions. including a massive rock slab, that has kept the highway closed. It is still too soon to tell when the highway will reopen. We have to remove the large rock slab, assess what is behind it and then stabilize the slope. Due to the current danger of the large rock slab breaking loose, the highway will remain closed. We know road closures are frustrating, but we simply cannot put our workers or the traveling public in danger by opening the road before we complete the necessary work. We’ll keep you updated on our progress while this work continues. You can sign up to receive email alerts with updates about the work to stabilize the hillside and news about when the highway will reopen. Many of us have been there at some point. Stranded on the road after a collision, or maybe because of a flat tire. Maybe you thought you had enough gas in your tank to make it, only to find out, well, you didn't. to assistant stranded drivers with some gas, a push or a tire change. It can be a scary situation to find yourself stuck with traffic whizzing by. Fortunately, between our Incident Response Team and our maintenance crews, we have people available to help. Recently we've gotten emails from drivers letting us know they were helped out of stressful situations when our crews changed a tire, jump start a vehicle or simply provided some calming words and traffic control to help the person off the highway. April is Work Zone Safety Awareness month, when we put extra effort into letting the public know what they can do to help keep all road workers safe. We have a lot planned, but we also want to hear from you. create a safe environment on the highways for drivers and road crews. Have you been helped out by a member of our IRT or maintenance crew? We want to hear your stories. What was the situation? What did they do? If you have something to share, please email allendm@wsdot.wa.gov. Help us work toward making the highways as safe as possible for all road workers. If you have traveled through the Canyon Park area recently, you may have noticed some changes to northbound Interstate 405. It’s all related to our new project, which we mentioned back in January, to add general purpose capacity to northbound I-405 between State Route 527 and I-5. With signs installed, testing of our new I-405 peak-use shoulder lane begins this week. Since then, work on the I-405 Northbound Peak-Use Shoulder Lane Project has been progressing. Crews recently finished installing four sets of electronic signs that, when the project is complete, will indicate when the shoulder lane is open to drivers and display messages about traffic conditions ahead. Now it’s time to start testing. Starting as soon as Wednesday, March 29, the signs will start displaying symbols such as different colored lines and shapes, and several test messages. These test messages will run until the lane is ready to open for use by traffic later this spring. 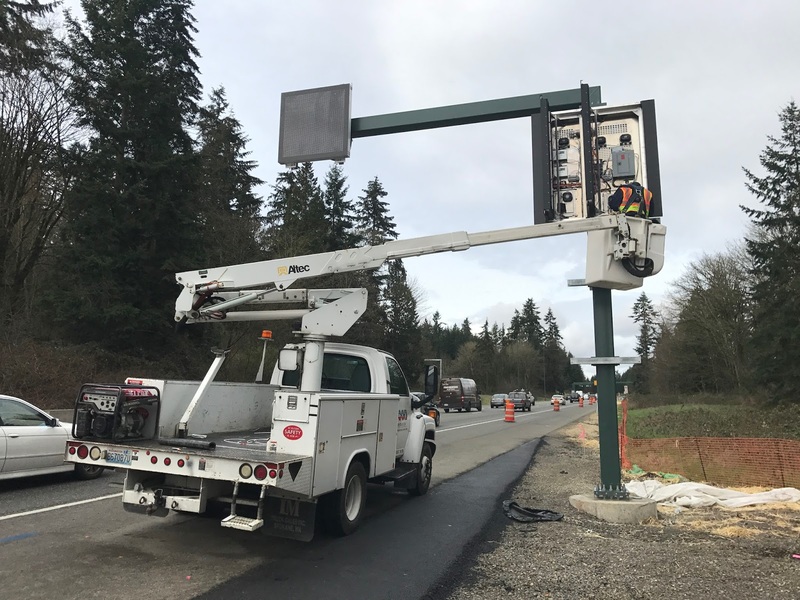 As this will be the first dynamic peak-use shoulder lane in the state, we are not only testing the signs individually to make sure they work but are also testing all the signs together to make sure the system will operate as planned once we open the lane. Symbols on the signs over the peak-use shoulder. What if there’s a crash? Some of you have been asking what happens in the event of a crash. We have worked with our partners at the Washington State Patrol to develop emergency protocols. 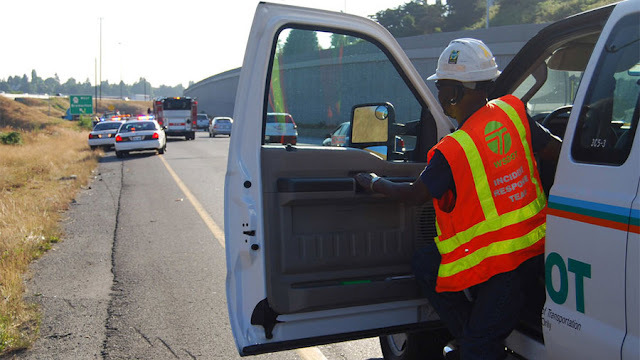 As with all highway operations, our Traffic Management Center will be actively monitoring the lane. If there is a collision or emergency, we will be able to close the lane to allow emergency services to respond. There will also be four paved emergency pullouts in the area of the peak-use shoulder lane. Stay tuned for more information about the exact opening date for the new peak-use shoulder lane, which is on track for completion this spring. All Rhonda Long wanted to do was get home. Traveling back from Yakima and well into an already 13-hour day, she turned north onto SR 7 in Morton on the very rainy night of March 9. With 100 miles to go before reaching her home in Port Orchard and a slow ride over US 12 behind her, Rhonda was ready to be off the road and safely through her front door. And then she hit a pothole. She pulled over to assess any damage but it was 8:15 at night in a driving rain, not ideal conditions to get a good look at her tire. Fortunately for Rhonda, Marty Wilkinson and Jack Thomas, maintenance technicians in the southwest portion of our state, were in the area. 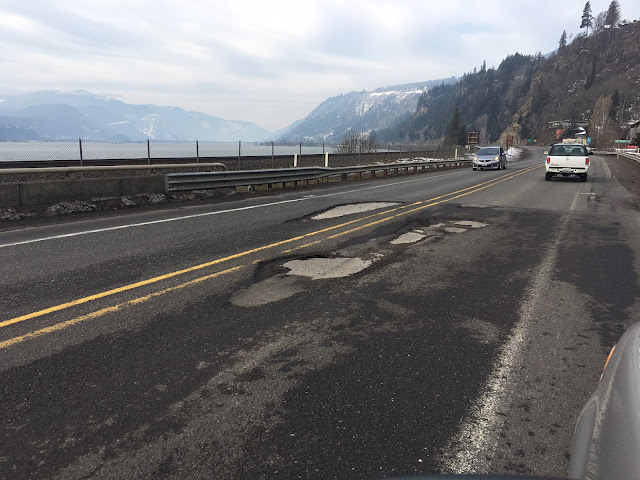 Jack and Marty were in the area fixing potholes on SR 7 and came upon Rhonda and another driver about 5 miles north of Morton. Both had hit the pothole and found themselves on the side of the highway. After helping the first driver with his tire and jumping his dead battery, they moved on to help Rhonda. "It was very dark and raining very hard but the first thing we think of is to keep the public, ourselves and our coworkers safe," Marty said. "We use our amber strobe lights to hopefully slow down traffic and that helps us all out." Adding to her problems, the wheels on Rhonda's vehicle also sank into the mud as rain pelted them all. But our crew was able to help get a spare tire put on and move the vehicle out of the mud, and soon Rhonda was on her way. "I cannot express how grateful I am for Jack's and Marty's help in getting safely off the road and out of the mud," Rhonda said. "I was able to get back on the road from that point! Exhausted, but home!" 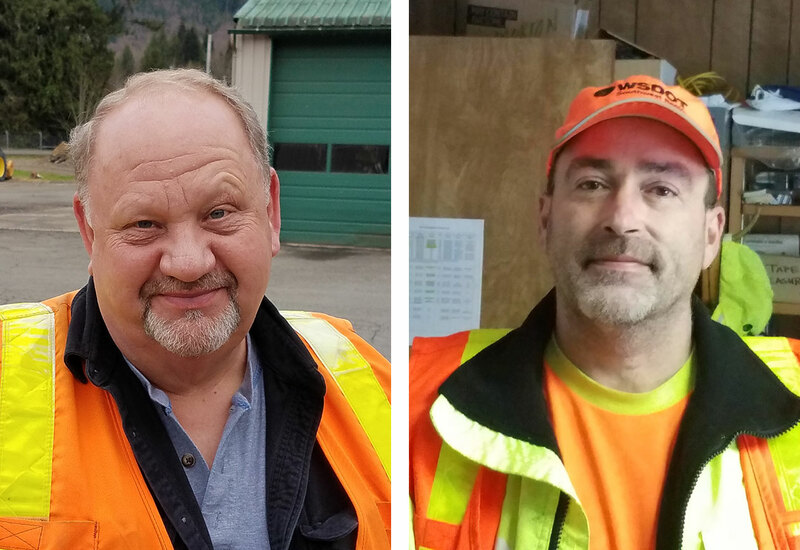 It was just in a night's work for Marty, Jack and the rest of our hard-working road crews. 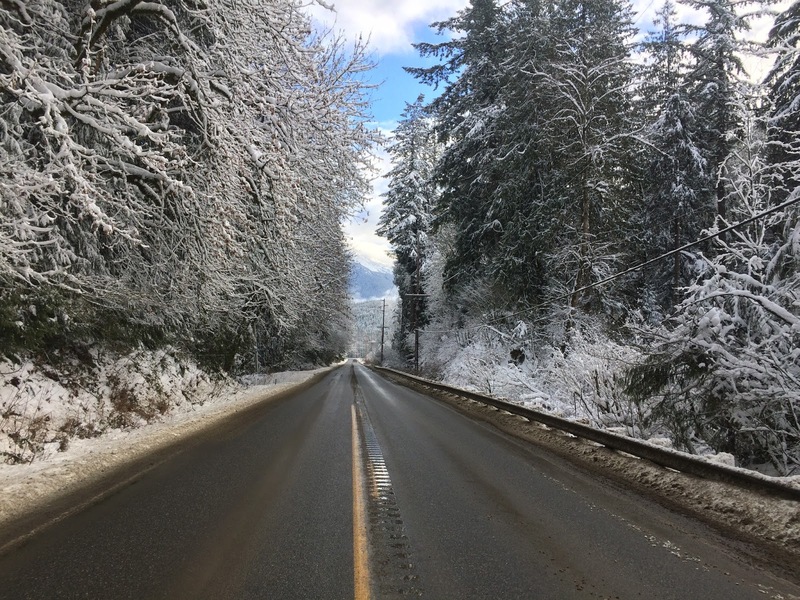 Not only do they put forth great effort to keep our highways safe, they also are always available to help out drivers in need, regardless of conditions. Jack and Marty went on to spend the night fixing more potholes along SR 7 with traffic control help from the Washington State Patrol. These workers don't look at these situations as anything special. But, but for people like Rhonda, who find themselves in need on dark, rainy nights, help from our crews and other road workers make a huge difference. Thanks for your service, Marty and Jack! With summer just around the corner, it's time to leave the passenger cabin for sunnier skies on the sun deck! Calling all high school students. We're looking for a sunny new look for our summer 2017 sailing schedule. Summer is our busiest sailing season, as millions of tourists and locals flock to our ferries to spend time on the water. 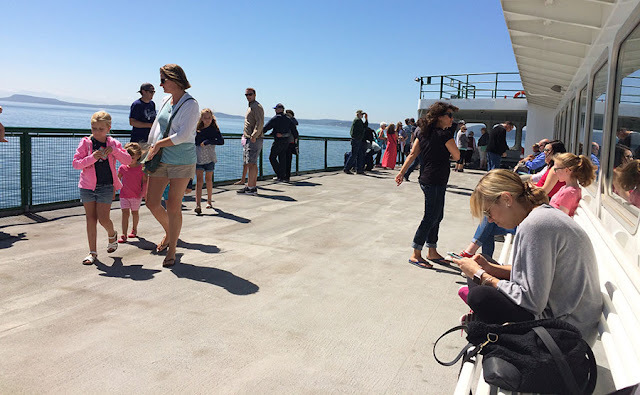 Whether it is yoga on the sun deck, riding a bicycle aboard for a two-wheeled island adventure, or taking in the sights from the pickle fork, summer on the ferry is an unforgettable experience. High schoolers are invited to send us their best drawing of what “Summer sightings on the ferry” means to them. As Alice Cooper crooned, school's out for summer – or will be soon – and high schoolers, we want you to indulge your summer break daydream and participate in our summer schedule cover contest! Students currently in grades 9-12 have until early April to create and submit original artwork based on the theme "Summer sightings on the ferry." 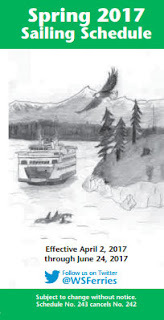 This summer we will print more than 985,000 ferry schedules with the selected cover art and distribute them across our 10 ferry terminals and 22 vessels that make up our fleet. With more than eight million passengers travelling aboard our ferries last summer, just think of all of the people who will see your artwork! All students currently in grades 9-12 are eligible and invited to participate in this contest. Submissions will be accepted beginning Wednesday, March 22. The contest ends Monday, April 10. No submissions will be accepted after that date. Electronic: Submissions must be 300 dpi or higher, and portrait oriented. Submissions cannot exceed 16 MB. By Mail: Submissions must be on 8.5 x 11 paper, and portrait oriented. Media: We welcome a variety of media, both designs produced by hand and computer graphic design.Submissions must be in black and white. Color submissions will not be accepted. Artists are encouraged to use bold, strong lines. Original artwork: All work must be original and include a ferry or elements of a ferry (i.e. life ring). No copyright images, text or other material will be accepted. (For example, artwork depicting characters from television shows, video games or books is not allowed). Ownership: Artist submissions shall be treated as being free of restrictions and limitations to their use. By submitting artwork, you give ownership to WSF and authorize WSF to post your entry on our website indefinitely, and grant WSF the right to use, print and publish your design. Deadline: All submissions must be received by Survey Monkey or mail by Monday, April 10. Our summer schedule drawing contest is open to anyone in grades 9-12. How do students submit their artwork? Electronic: Submissions must be entered via Survey Monkey. Please fill out the form with contact information and upload the artwork by Monday, April 10. Please note: Each student may only submit one entry. Who will select the winning artwork? A panel of judges from the WSF executive team will review entries. A winner whose work best depicts the theme of "Summer sightings on the ferry" will be selected. Entries will be judged on creativity, originality, clarity of theme and artistic merit. Five finalists will be selected and featured on the WSF website, on the WSF Twitter, and in the WSF weekly update. 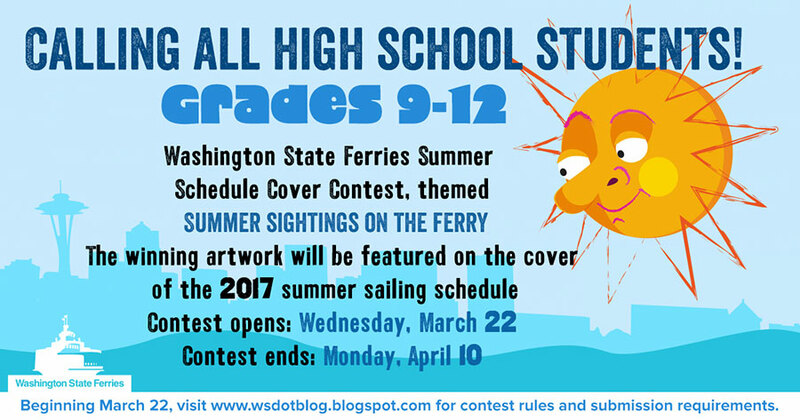 From those finalists, the winning artwork will be chosen to be featured on the 2017 WSF summer sailing schedule. Morning commuters, we understand your frustration. Whether you were late for work, school or appointments on this dreary Wednesday, sitting in traffic could not have been any fun. So what happened, exactly? Why did it take more than four hours to clear the semi-truck that crashed and rolled over on northbound I-405 in Bellevue? On top of that, why did traffic clog up on I-5 and I-90? Let's get right to your questions. Just after 5 a.m. Wednesday, March 15, a semi crashed into the barrier between the northbound I-405 lanes and the off-ramp to Northeast 4th and Northeast 8th streets in Bellevue, splitting the trailer in half. Tons of boxes packed with clothes and paper products went pouring onto the roadway. The impact of the crash also ruptured the truck's gas tank, spilling nearly 100 gallons of diesel. We worked with the Washington State Patrol to close all lanes of northbound I-405 for approximately an hour before opening two lanes. Then, the real work began: It was time to clear the truck and clean up the mess. What does it take to clear a crashed semi-truck? Clearing a split semi-truck trailer and its cargo and leaking diesel is no easy task. Not only did we need to safely secure the area and set up traffic control, we also needed to get all the right people and equipment there so we could clear the scene and get traffic moving again. Our overnight maintenance crews rushed to the scene to help WSP with traffic control. Our first priority was to keep drivers away from the debris in order to keep them safe and avoid any secondary collisions. It was also crucial to create a safe work zone for our crews so they could do the cleanup work. It took careful coordination to get the right equipment and the right people to the scene. Get a load of this: Crews on scene needed to get a giant tow-truck, designed to haul semis; giant flatbed trucks that could carry the two halves of the trailer; and a loader to remove all the debris. The Department of Ecology (DOE) sent a crew to inspect and clean the spilled diesel, which can present both safety and environmental hazards. Crews used the loader to push the debris off the freeway and onto the exit ramp so we could get all lanes of I-405 moving again. We were able to reopen all lanes of traffic just before 9:30 a.m. However, we kept the exit lanes closed while we loaded the spilled cargo into empty trucks by hand and then haul it away. At the same time, the DOE crew cleaned up the spilled diesel. Maintenance crews also had to fill orange barrels with sand in order to create a temporary barrier between the exit and the freeway. Why was traffic so bad everywhere? You probably noticed while stuck in traffic that it was pouring down rain. Combine that with the crash, and you get a ripple effect on traffic throughout the area. Then, throw in the inconvenience of this happening during rush-hour conditions. Top it off with only two lanes open on a very busy northbound I-405 and traffic diverting to I-5 and city streets and, well, you have a big influx of congestion just about everywhere in the area. Call it the imperfect storm. 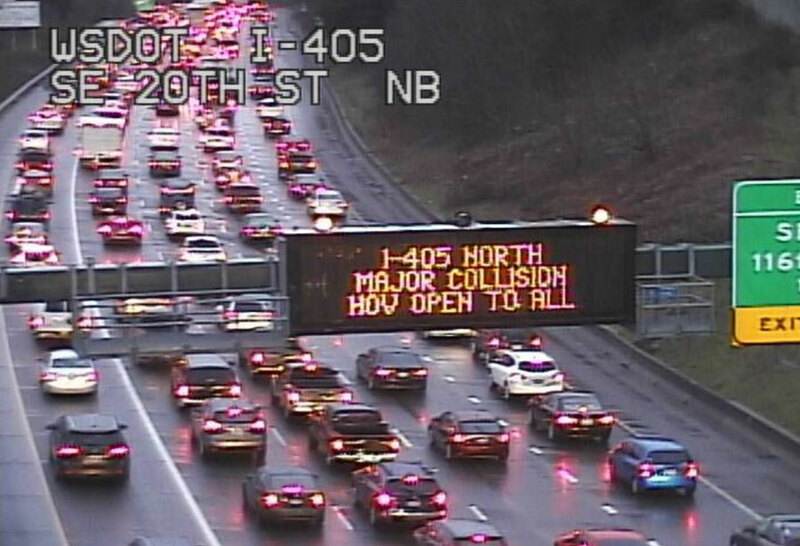 Our Traffic Management Center worked quickly to alert travelers of the closure on our overhead messaging signs. Our communications team turned to social media right away to let people know before they hit the road so they could avoid the area and take alternate routes. We want to thank all of you affected by today's snarled roads, and for staying engaged about the changing traffic conditions while our hard-working crews and all of the first responders worked to clear the scene and get you moving again. Many of you turned to our social media accounts to learn more about the situation. This is a good reminder to prepare yourself, your passengers and your vehicles for the possibility that you could get stuck in a traffic jam at any given time. It's always a good idea to have water, snacks, entertainment for the kids and blankets in your vehicle. Final words of wisdom: If your gas tank is half-full, it's also half-empty – you should fill it up. For commuters driving between the Kitsap and Olympic peninsulas, the Hood Canal Bridge is a vital piece of our transportation network. As one of the world's longest floating bridges, it turns what would be a 115-mile trip around Hood Canal into a 2-mile trip, and is a lifeline for communities. Unlike other floating bridges in the state, this one sits in salt water. That harsh and corrosive environment means that the bridge requires daily maintenance to ensure it functions for both marine and vehicular traffic. Each week, bridge crews perform preventative maintenance on the bridge, just as you do when you change your car's oil or windshield wipers. At some point however, a major mechanical part in your vehicle needs to be replaced, such as a transmission. 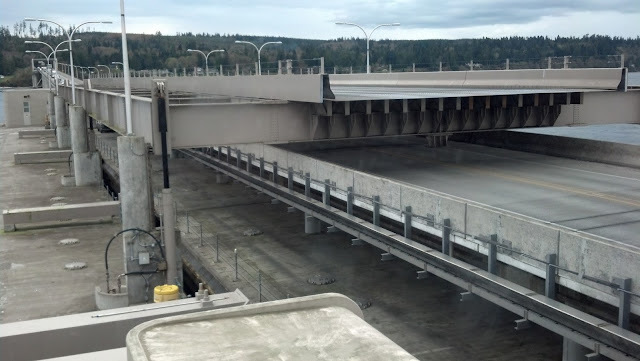 That's a good analogy for the work we have started for the Hood Canal Bridge, While repairs to your car may take a day at the mechanic, our bridge repair work will last into the fall, and will require numerous bridge closures. allow access to the mechanisms and wheels of the bridge. Up to 12 overnight closures will occur. The first set of closures occurred in late March; the second set of closures will occur during night hours on Sunday, Monday, Tuesday and Wednesday, April 2-5, between 11 p.m. and 5 a.m. During that time, the bridge will close to vehicle traffic. Why does the drawspan need to be open for the work to take place? The Hood Canal Bridge is unique. When we need to replace parts, they must be built to order. During the upcoming closures, crews will take exact measurements of the guide roller wheels responsible for opening and closing the drawspan. They need the drawspan to be open to access the mechanisms and wheels, first for measuring them and, later, for replacing them. We realize having the bridge closed to traffic is a big disruption to area residents, so we've worked hard to condense the closures down to as few days and hours as possible. We scheduled the closures at night when we have lower traffic volumes. 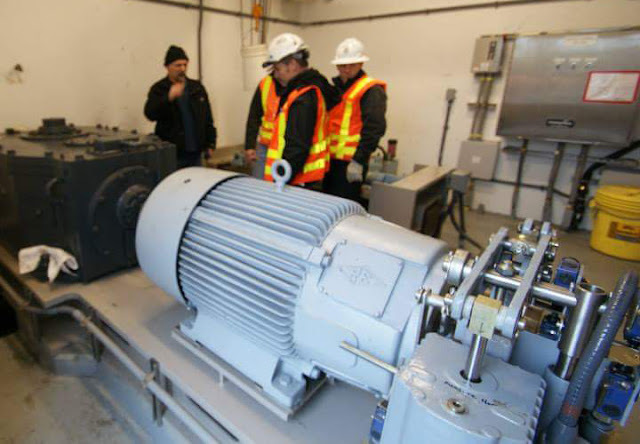 The gear boxes of the Hood Canal Bridge will be replaced with new ones during our upcoming bridge repair project. What will happen if there's an emergency on either side of the bridge? Area emergency services are aware of the upcoming closures. We have a plan in place to ensure that we close the drawspan as quickly as possible to get emergency responders across the canal if necessary. The amount of time needed to close the drawspan will depend on what activities the contractor is doing when notified by emergency services. Why wasn't this work done when the east half of the bridge was replaced in 2009? We did replace some of the mechanics during that project, and we are now replacing more parts. This ongoing maintenance is critical to keeping the bridge functional. In fact, we will be back again next summer for another construction project during which we will replace steel girders in the bridge. In a perfect world, we would be able to do all this work at once. The reality is, however, that we must schedule the work when funds and resources become available. Our job is to gauge the most effective times and methods to do this work while meeting the myriad other transportation needs in the state. Why didn't you provide more advance notice of these closures? We try to provide as much notice as possible to the public when we get ready to start projects like this. Our goal is to balance advanced notification with accuracy. Mother Nature can waylay the best of plans, so we work closely with our contractors to hammer out schedules that provide as much accuracy as possible so that when we do provide the information publicly, it's useful and reliable. Even so, changes to construction schedules are commonplace and we may well need to modify dates and times of bridge closures as we move forward. We apologize for the inconvenience these closures are causing, but please know that we are working in your best interest to ensure a functioning canal crossing. You may have dug your car out of a snowdrift a time or two, but have you uncovered a vehicle that was buried under 4 feet of snow? 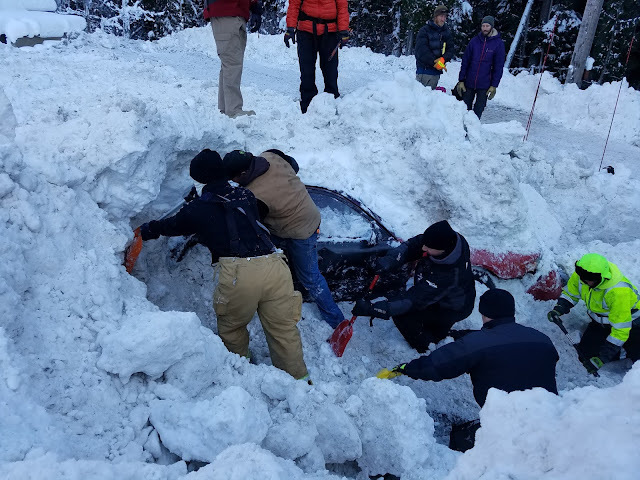 That’s exactly what our Stevens Pass maintenance crews – along with several other agencies – do each year as they learn how to search for, locate and unearth vehicles buried under a snow slide. It’s a skill we hope none of them ever has to use, but it’s a vital one for the crews up on the pass. Students learn how to use probes to locate a vehicle buried in a snow slide or avalanche. We have maintenance workers specifically tasked with avalanche prediction and prevention. The annual avalanche response training, however, is for all of the maintenance crews, because any worker up on a mountain pass could encounter a snow slide. That’s also the reason we invite other agencies to participate – because a utility worker or law enforcement officer could be the first responder on scene and also are valuable partners to our own crews. The class is held at Berne Camp, our maintenance facility eight miles east of the Stevens Pass summit. Students first learn about each agency’s procedures so they understand what each other can and can’t do during an emergency. This helps all the agencies – such as county sheriff’s offices, ski area employees, utility workers and towing companies – coordinate on any type of emergency response. We’ve been doing this for three years and have seen our partnerships grow with each agency that takes part. This year 11 agencies participated. Crews practice using probes to determine a buried vehicle’s location in the snow following an avalanche. 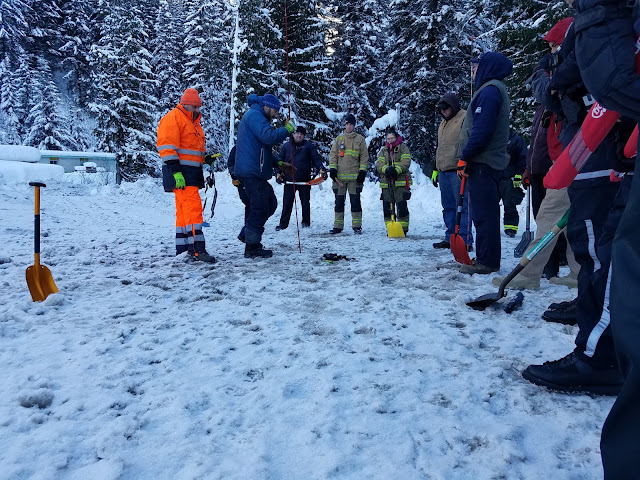 Once outside, students practice using beacons and probes to find a buried vehicle as well as the proper shovel technique to quickly find a vehicle and get occupants to safety. (Hint: Don’t dig straight down, come in a few feet over.) Then, the big finale: finding and unearthing a vehicle that instructors have buried under 4 feet of snow somewhere on the grounds. (Our buried vehicle comes from a wrecking yard). Students aren’t timed during this training, but in real life time would be critical. That’s why we have the crews practice now when there is still time to work out any problems or ask questions. What if you’re in an avalanche? Of course, we work hard to reduce the risk of anyone getting caught in an avalanche on our passes, but we can never completely eliminate the risk. 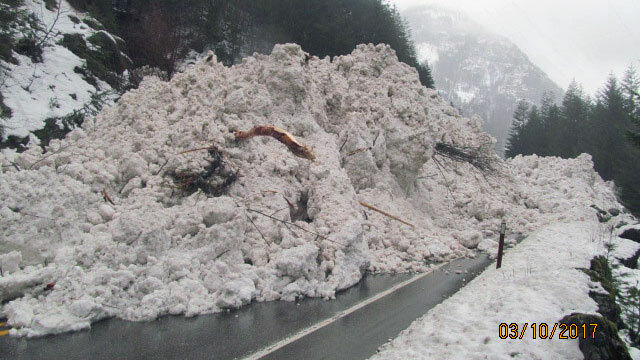 This year we’ve seen vehicles buried in snow slides or avalanches in nearby states such as Wyoming, Utah and California. We hope our crews never have to use these skills, but we’re glad to know they’re ready just in case. 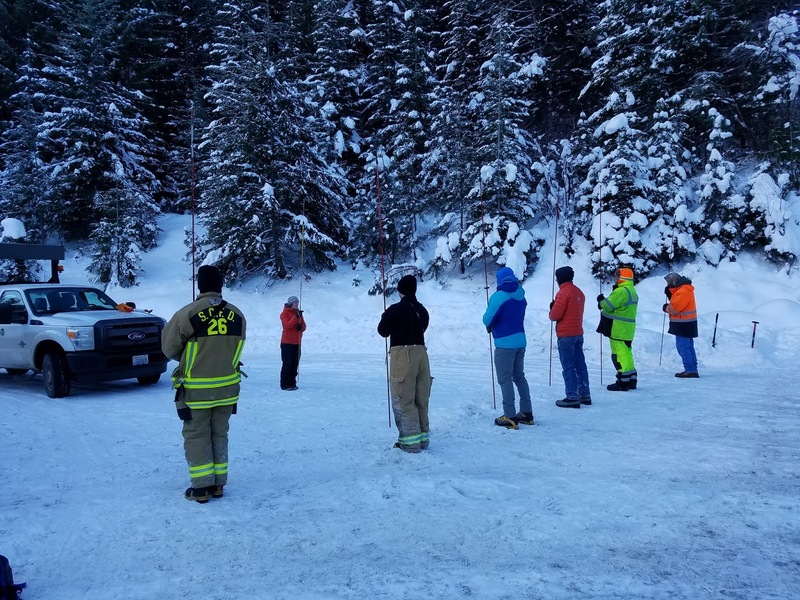 4 feet of snow as part of avalanche response training in December. 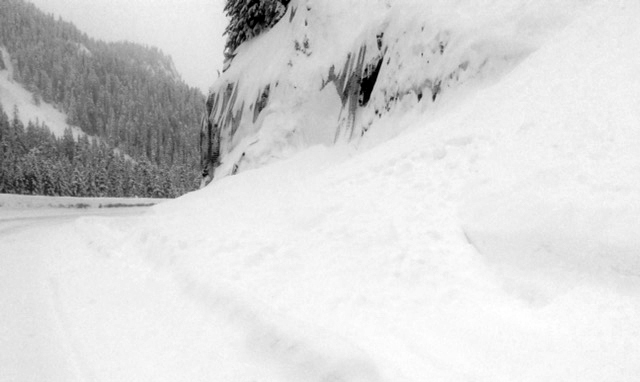 What should you do if you’re ever caught in an avalanche while driving? Never drive around a road closure sign. No one likes a closure, but these signs are there to protect both you and first responders. UPDATE March 13, 12:25 p.m. 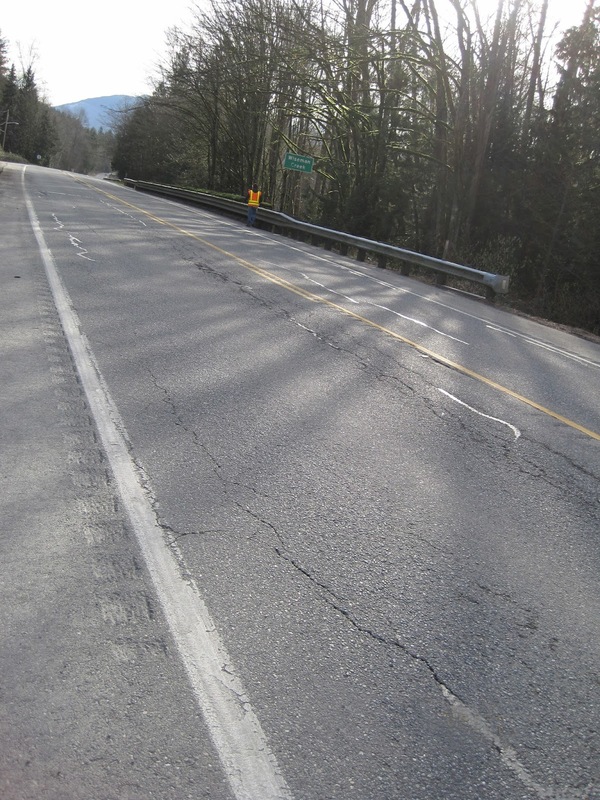 The eastbound lane of SR 20 is now open. It is reserved for emergency vehicles and to allow people isolated in and around Diablo since Friday to leave, including students on a field trip to the North Cascades Institute. Work to clear the westbound lane is scheduled to start tomorrow. It will take at least a couple of days before it is safe to reopen the highway to the public. This morning our crews began work to clear the snow slide that has blocked the highway since late Thursday night, March 9. We are cautiously optimistic we can get one lane open today. Once reopened, traffic will be reserved for emergency vehicles and to allow people isolated in and around Diablo to leave. It will take multiple days for crews to completely clear the 40 foot deep, 150-foot long slide that includes not only snow, but also trees and heavy rocks. Our crews will focus on getting the eastbound lane open first. Safety is our top priority and while we know many people have been anxious to reunite with loved ones, we needed to make sure the area was safe for our crews as well as travelers in the area before we started to clear the slide. We have lost a member of the WSDOT family to an avalanche in the past, so we leave nothing to chance and make our decisions about crew and driver safety very seriously. Our avalanche techs evaluated the area throughout the weekend but the rising temperatures and rainfall continued to create unsafe conditions in this and other areas of SR 20. Moving heavy equipment in before these areas were stabilized would create a risk to our crews. 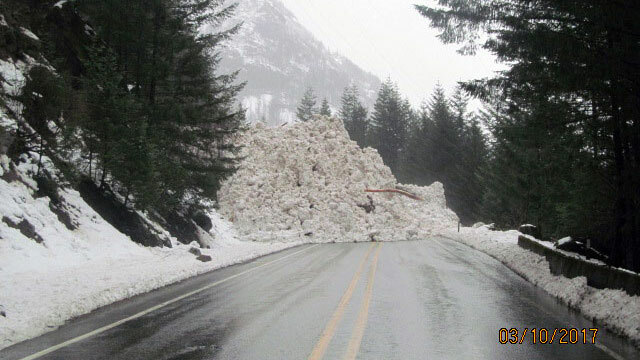 Crews are working to clear a snow slide that is blocking both directions of SR 20 at milepost 123. Weather conditions quickly change in the mountains and travelers should always make sure they're prepared when heading into these areas. We work closely with agencies, like the National Weather Service, which forecasted high avalanche danger in the Cascades last week. Through conversations with school districts and businesses affected by this slide, we knew everyone stuck on the other side had plenty of food and were safe. Conditions have stabilized and crews are working clear one lane of SR 20 in east Skagit County. Our maintenance crews will work as safely and as quickly as they can to reopen one lane of the highway. First, they will use an excavator to remove trees, rocks and other debris. Next, they will use a snow blower to remove all the snow. Thank you to everyone affected by this slide for your patience as we work to clear the slide. Enormous. Gigantic. Immense. No matter what word you choose, it's difficult to convey what it feels like to step into the SR 99 tunnel and watch the tunneling machine Bertha at work. Anyone who walks through it is in awe of its record-breaking size. We wish we could give everyone a tour of all the work going on, but it's not practical. That's why we hope this unique video tour is almost as good as being there. 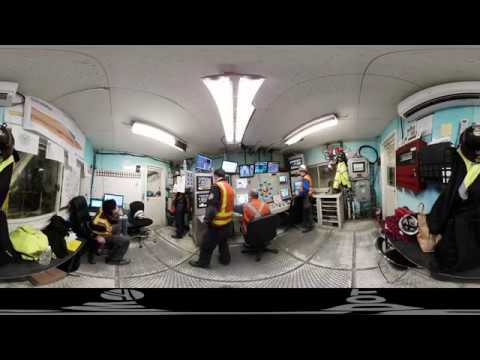 With a 360 degree camera, Alaskan Way Viaduct Program Administrator Joe Hedges takes you inside the tunnel and the tunneling machine Bertha, but YOU guide the tour. If you haven't experienced this type of view before, here's a quick primer. If you're watching on your smartphone, turn your phone to see what's behind you, above you and below you. Watching on your computer? Grab the picture with your mouse to move it left, right, up and down. Watch it more than once and you'll see the tunnel, and Bertha, like never before. Take a look and let us know what you think. We hope you enjoy this unique perspective to get a sense of all the work happening out of sight, underneath Seattle. It's been a long winter and it doesn't look like the end is in sight, at least not for the next couple of days in the mountains. The weather forecast is calling for up to eight inches of snow to fall in the mountains by Wednesday night with another seven inches by Thursday morning. By Thursday afternoon, the snow is expected to switch to a rain and snow mix then to a heavy, wet snow by Thursday night into Friday morning. While warmer weather is usually welcome news this time of year, in this case, it presents a challenge. These conditions can cause the snow pack to become unstable and increase the risk of avalanches. 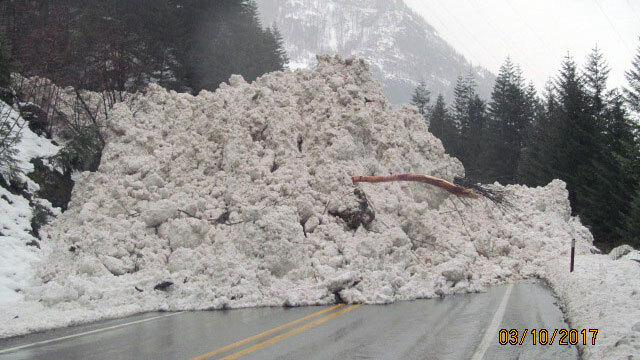 The last time we saw these kind of conditions was in early February when avalanche danger kept all three mountain passes in the state – I-90 Snoqualmie, US 2 Stevens and US 12 White passes – closed for more than 24 hours. closures over the next few days as heavy snow turns into heavy rain. While we can't control the weather, we can be proactive by helping you with your travel plans. And for this weekend, that includes a lot of students from Washington State University who may be returning to the west side of the state for Spring Break. If Mother Nature follows through with the next round of snow and rain, there is a very good chance we will have to close one, two or all three of the mountain passes due to the risk of natural avalanches, snow slides and to conduct avalanche control work. significant avalanche danger in our mountain passes over the next few days. Whenever we close a mountain pass the most common question we get is "How long will it be closed?" That's a very tough question to answer. If it's for avalanche control, it's usually between 20 minutes and 2 hours depending on how much snow and debris comes down. But a closure due to avalanche danger is a wildcard. Until that danger subsides, we often can't even send our crews into the area to do avalanche control or cleanup, for their safety. In those cases, even coming up with estimates for length of closure is tough. The true answer is, "Not until it's safe for everyone to be in the area." So how can you prepare? If you can, try to postpone your trip over the mountains until later this weekend. If not, try to go before Thursday afternoon. Be sure to check our mountain passes web page for updates on conditions and traction requirements. And be prepared in case you find yourself stuck in a closure. Closing a pass is never something we take lightly but safety is always our top concern so please be aware of what may be on the horizon and be sure you and your vehicle are ready just in case. additional deterioration of the highway until repairs can be made. 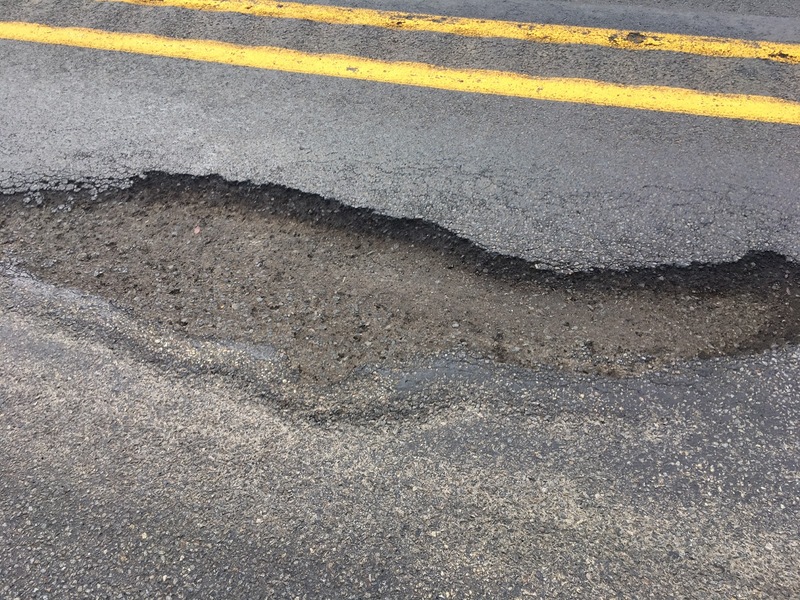 It’s no secret that the pavement on SR 14 east of Stevenson is in rough shape. Widespread potholing is a result of water seeping into the roadway, coupled with the deep freeze and the weight of heavy traffic. With record rainfall in the last month, it is difficult for us to patch the problem areas in a timely manner because we need dry weather for the materials to stick properly to the roadway. freeze and heavy traffic has created several such potholes on the highway. 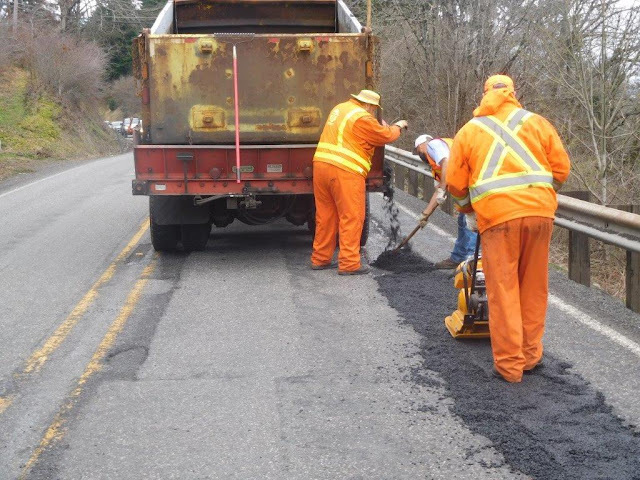 We’ve secured some funding to continue patching the highway, and we’ll be out as the weather cooperates. As a preventative measure, and for the safety of drivers, we have reduced the speed limit through some areas to help avoid additional deterioration of the highway from traffic moving at high speeds. Maintenance crews make the most of dry weather to make repairs east of Stevenson Friday, March 10. We would like to have a contractor out as soon as possible to remove the existing damaged roadway and repave the highway. This could begin sometime this spring, but we need good weather to ensure that the work is done right, and lasts a long time. Our maintenance crews see a lot of unusual things while they're out on the job. But this might be one of the strangest. 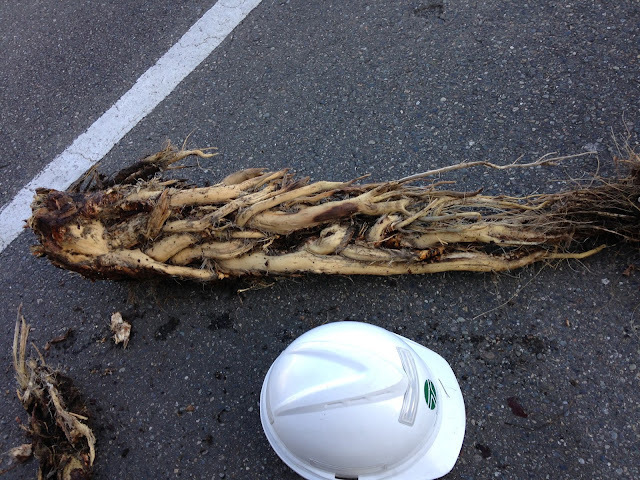 WSDOT workers found this root lodged in a pipe near Auburn's Centennial Viewpoint Park by SR 181. While clearing out a drain near Auburn's Centennial Viewpoint Park in February, one of our maintenance crews noticed a lot more water than usual rolling down the hill towards West Valley Highway. That water should have been running through one of our underground pipes. After some investigating the workers found exactly what was causing the problem: a massive, gnarly-looking root lodged into an underground pipe, about 50 feet up the steep hill to the park. "We pointed a flashlight in there, and you could see [the root]," maintenance superintendent Mike Golden said. But that wasn't all. About 75 feet farther up the pipe, another massive root was clogging things up as well. How could they tell? Well, with water bursting out of the pipe because of built-up pressure from the obstruction, it was pretty obvious. The crew recognized it was only a matter of time before this turned into a much bigger problem. The combination of heavy recent rainfall and a very steep area presented a danger of the hillside washing out and falling onto the highway. But the geography of the area presented another challenge. A steep hill covered with trees is not conducive to bringing in large machinery like excavators. So our crew went the old-fashioned route: Their own two hands. After working most of the day to dig out the pipe by hand, it wasn't just the twisted root that was unusual. The pipe itself presented its own surprise. Most pipes in our state these days are made of durable steel or concrete. But this pipe was likely installed at least 30 years ago, when corrugated aluminum was popular because they were light-weight and less susceptible to rust. 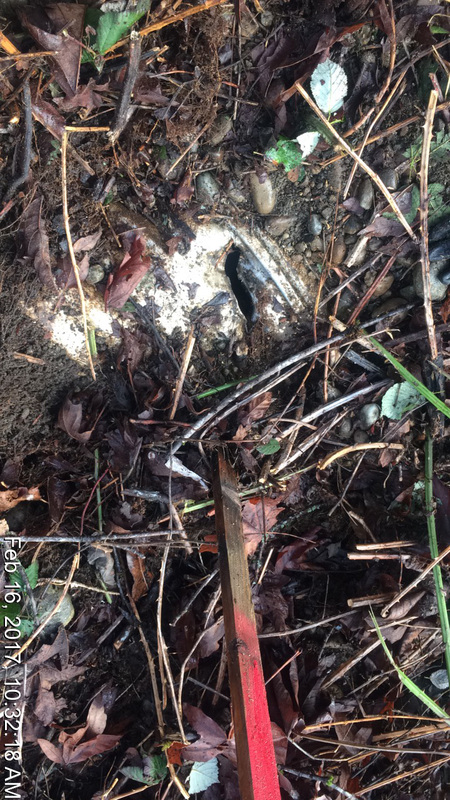 That's the type of pipe our crew encountered, and it helped answer the mystery of what was happening. "They're not as strong as steel or concrete," Golden said of the older pipes. "During a storm, a tree branch can fall and puncture a pipe like that. Or a root can find an opening in a joint and get in." Once the crews knew what they were working with, the time came to get the root out. They cut the top of the pipe to make a doorway then reached in with a chisel and cut the root out. Once they removed the root, they sealed the pipe back up. The twisted plait of thick wooden strands fit snugly in the 12" diameter pipe, and stretched nearly three feet long. How did it manage to grow that big? 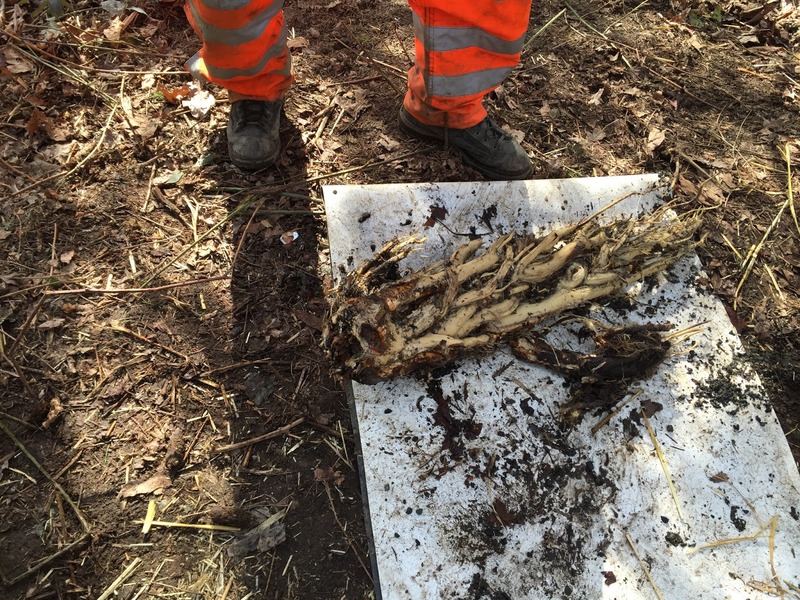 The unearthed root next to one of our workers. "The roots feed off the water running through the pipes and continue to grow," Golden said. "Even during the dry summer months, there's always water through there." As unusual as this sight was for Golden, he said it's not the biggest root he's seen in his almost 40 years at WSDOT. "A couple years ago, right by I-405 and State Route 181, there was a cotton wood tree growing near a 24" culvert. One root got inside, and grew about 50 feet long," he said. Blocked pipes are serious business. Left unnoticed, they can lead to landslides, or worse. That's why we need your help to spot plugged pipes before they cause big problems. So how do you spot a blocked pipe? Look for brush growing out of the ends of the pipes. That's a good indication that a root or branch is lodged in there, and continued to grow. If you see something like that, contact your local maintenance office by phone, or send us your concern. 20 miles of SR 20 in east Skagit County. My colleagues and I love getting out into the community and meeting with the public face-to-face. It gives us a chance to hear your stories, your concerns and get your feedback on our highways and future construction projects that are planned. With summer construction season just around the corner, look for many of these opportunities coming up. With fish passage, paving and intersection improvement projects among the things on our upcoming schedule for Skagit, Island and Whatcom counties, we want to keep you updated on what’s going to happen and be able to hear any questions you might have. Come hear about this summer’s Hedrick Creek fish passage project, SR 542 guardrail installation and next year’s SR 542 and SR 9 intersection improvement project. We’ll focus on the 30-mile paving project our contractors are starting this month on SR 525 and SR 20. We’ve invited other partners on Whidbey Island to join us for this event in case you have questions for them, too. Hedrick Creek fish passage project and guardrail installation. If you want information about all of our 2017 projects happening in Skagit County, this is the event for you. We have invited partners from all over Skagit County to join us – Skagit County, City of Sedro-Woolley, Washington State Patrol and Port of Skagit have confirmed their attendance. We’re still a year away from the 2018 Sharpes Corner intersection improvement project but we’ll have lots of information about that project as well as this summer’s SR 20 Spur paving project. 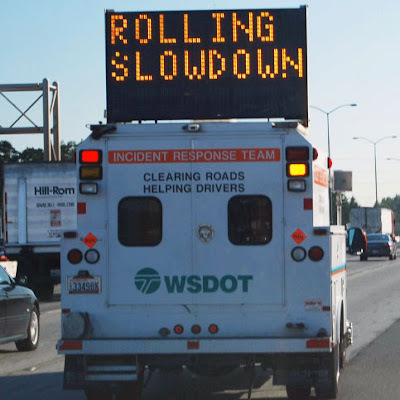 If you aren’t able to make the open house in your community and have feedback or questions, you can email me your thoughts at PetricA@wsdot.wa.gov. We’re looking forward to meeting some of you this month and next. Thank you for being involved in your community and getting engaged in the conversation to help keep your family and all of Washington moving forward.